That’s the number you should concentrate on today, and for the next nine months. It’s a specific number, to be sure. But it’s as important a number as you’ll see in today’s gold market. “China’s gold imports from Hong Kong rose in February,” Bloomberg reported this week. Net imports calculated by Bloomberg are a roundabout way of following the gold trail to China. Since the Middle Kingdom doesn’t report its gold total officially, the Hong Kong numbers are our best guess of the gold flowing into China’s borders. The big takeaway here is that China is continuing to steadily accumulate gold. It’s something we’ve covered in these pages a bunch — in fact, I’m on record telling you that this will be the biggest gold story of the decade. Simply put, if you’re interested in gold, you MUST be interested in the story developing out of China. The numbers revealed in the chart above are huge. Just in that graphic alone — a two-year snapshot — China has more than doubled its gold holdings. But the more important number is 5,430.48. By my calculation, China is now “officially” holding 5,430.48 metric tons of gold. Beyond the 1,054 metric tons that China owns up to holding, that’s an added 4,376 metric tons! That total easily places China as the second largest gold holder in the world (second only to the U.S. — if you believe Fort Knox has gold and not a stack of IOUs). China isn’t slowing down, either. And as I’ll show you in a moment, this could be the next big catalyst to spur gold prices higher. How soon? I believe we’re going to see this come to a point less than nine months from today. First, though, let’s clear up some math — because we know the Chinese won’t do it for us! Imports. Over the past few years China has ramped up its imports: from a mere 60 metric tons in 2009 to a whopping 1,108 in 2013. 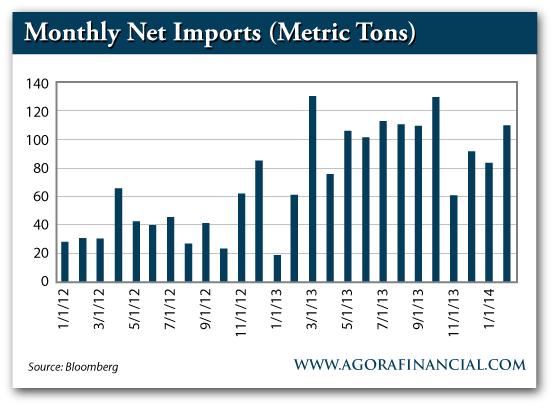 Add it all up and via imports alone, China could be holding an EXTRA 2,436 metric tons. Production. Quietly, China has also become the world’s largest producer of gold. Move over South Africa and the U.S.! Since 2009, the Middle Kingdom has produced nearly 2,000 metric tons of gold (1,940.06, to be exact). Stealth Gold. Besides the two rather calculable stats above, there’s another way that China may be stocking up on precious metals. I’ve written before about the idea of China claim-jumping in far-off lands like Ghana as well as the potential for the same in the rest of Africa and South America. But believe me, if we “caught” China claim jumping in Ghana, just think about all the other places they’ve amassed ounces. This “stealth gold” isn’t part of the 5,430.48 but might as well be! “But Matt, why do you keep referencing 2009?” you may ask. The last time China announced its official gold holding was back in 2009 (April, I believe). And the time before that was 2003, when they announced they had 600 metric tons. So 2015 is your huckleberry. That’s the year I believe China will splash the gold world with a huge announcement. An announcement that could light a fire under gold prices. 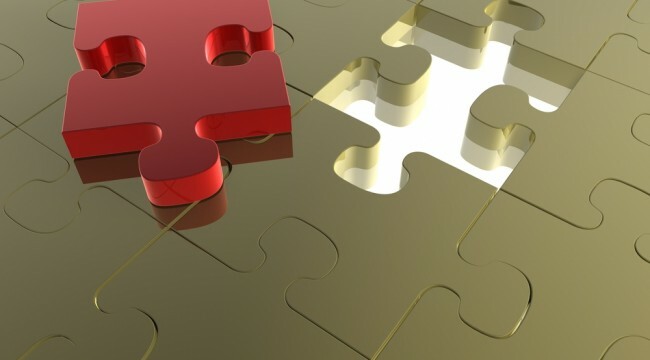 And regardless of the precise date we think they’ll announce their holdings, the real importance is the fact that the Chinese are HOARDING GOLD in a strategic concerted effort to strengthen their currency and put it on the world market to compete with other major currencies, including the U.S. dollar. China is a strategic nation, much like Russia. Only instead of getting into a “hot” war with the U.S., they may go for a currency war. While the U.S. continues to rack up debt and print U.S. dollars, keep an eye out for China’s big announcement. And in the next nine months, keep any eye on your favorite gold investments. P.S. Now may be a good time to check out your favorite gold investments — the big miners and some of the small guys. For a look back at some of our favorites, simply sign up for the FREE Daily Resource Hunter, right here. This article originally appeared in Daily Resource Hunter.